It is modern and comfortable. Everyone has a good view of proceedings. The Catafalque is central and the curtains, should you decide to use them, are just visible in this picture, and close very close to the coffin. This is a good chapel for family members to carry the coffin as there are no steps or low doors to negotiate. Arrangements for music are excellent here as are the staff. We enter via doors at the bottom of the picture and leave through the side doors. The Chapel seats just over 80 mourners plus a small balcony where the picture has been taken from. 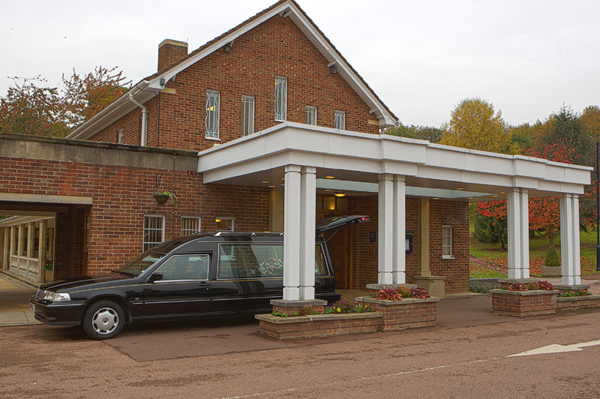 Services can be up to 30 minutes, and it is only £97.00 crematorium fee to increase this to up to one hour. Now this might sound like a long time, but remember you don’t have to use it all. Sometimes it is good to have just a little longer and do it comfortably, rather than rush it, or even worse, not do something you later regret. Talk to me about what you want to do. This is where we begin. There is reasonable parking here at the Chapel entrance plus further car park along the drive.